Four-term Governor Terry Branstad officially begins his fifth term today. 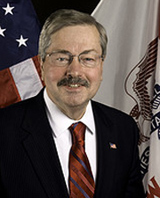 Branstad, a Republican, left office in January of 1999 after serving 16 years as governor. In October of 2009, Branstad retired from his job as president of Des Moines University, the state’s largest medical school, and launched what he called a “comeback” bid for governor. Branstad is scheduled to take the oath of office at about 10:15 this morning. Branstad told a group of reporters and editors last week his wife, Chris, has urged him not to give a long, boring speech. Branstad intends to use his Inaugural Address to encourage Iowans to embrace the spirit of service. “Probably the most memorable thing I ever remember from any inauguration was from (President) John Kennedy’s speech. It’ll be about the 50th anniversary of that. It was 1961 when he said, ‘Ask not what the country can do for you, but what you can do for the country,'” Branstad said last week during an appearance at a forum organized by the Iowa Broadcasters Association and the Iowa Newspaper Association. When Branstad became Iowa’s 39th governor in January of 1983, he was the youngest governor in the country. Branstad is now 64 years old. Today’s inaugural ceremony will be held at Hy-Vee Hall in downtown Des Moines. That’s the site of tonight’s black-tie-optional Inaugural Ball, too. More details of Inaugural-related events are posted here.